The Chinese are less concerned about safety than American. We worry about health risks, perhaps obsessively at times, but from my perspective it’s less of a concern to them. As I wrote, I thoroughly enjoyed a recent trip to China, but now want to discuss some observations on medical issues in China. 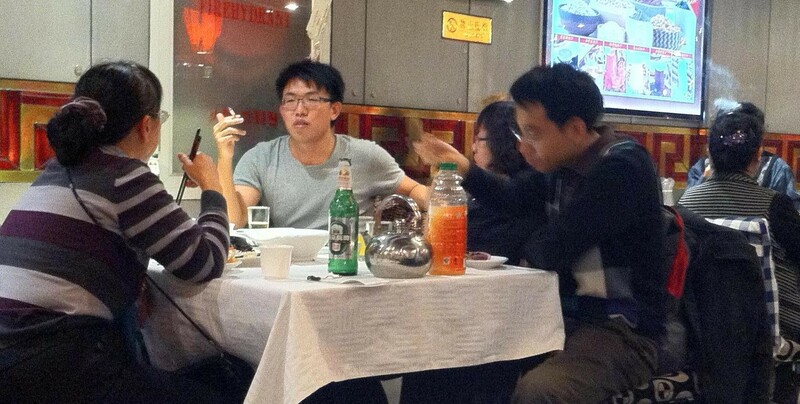 Smokers at tables flanking a no smoking sign in a Beijing restaurant. In some of their cities, they breath in much more pollution. 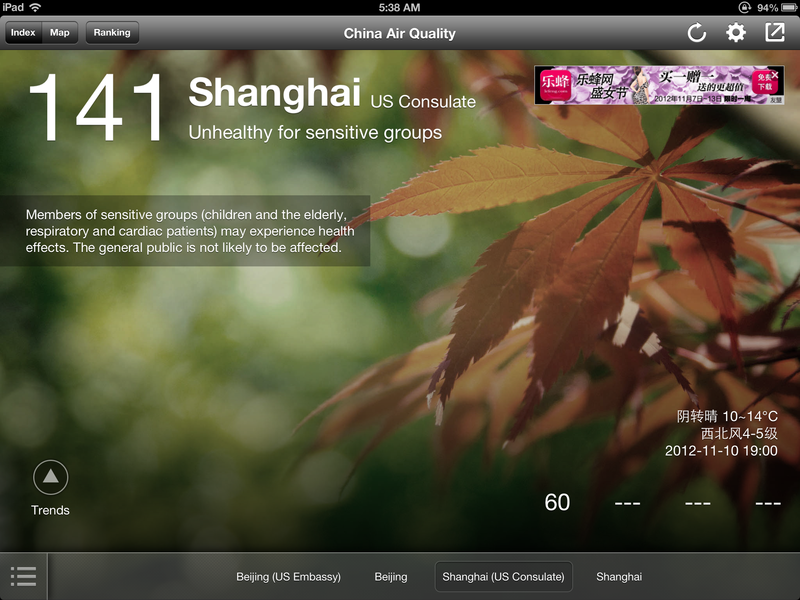 The Chinese government publicly posts measurements of the air quality, but it’s often significantly less than the United States Embassy measurements. Here are readings I recorded during our trip. This score of particulate matter was created by the Environmental Protection Agency and goes up to 500, which was supposed to be the scale maximum. 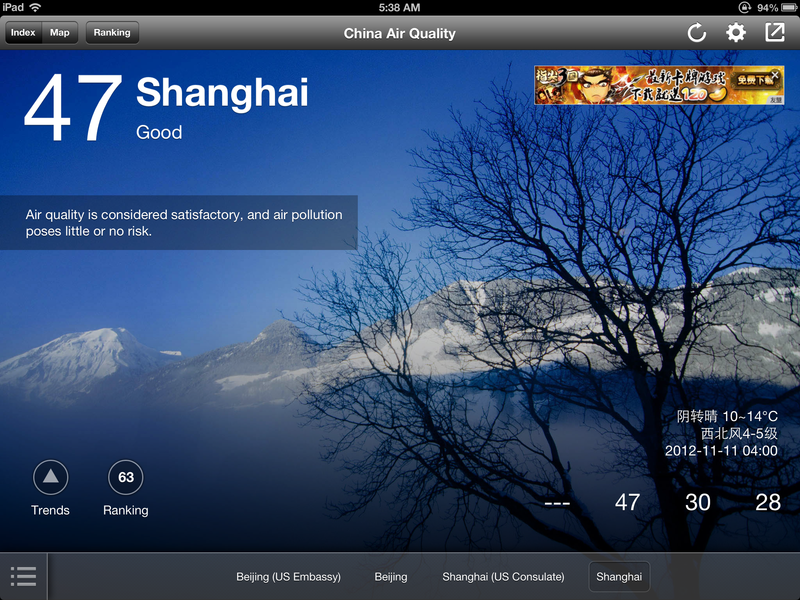 Recently readings in Beijing have been as high as 755. According to China’s Ministry of Environmental Protection, less than 6% of vehicles in the country meet the highest environmental standards, and there is particularly a problem with the tiny particles known as PM2.5, thought to be particularly toxic. Most of this is generated by older cars and trucks. Bicycle and motor scooter riders don’t wear helmets. In 3 days of driving around Beijing our guide never wore seat belts, even on the highway. The driver only wore it one time briefly. Eighty percent of car sales are to first time buyers, and many of them have little experience. Pedestrians do not have the right of way. One evening we drove past a man crumpled up on the street, with a man standing next to him talking on the phone, and no ambulance in sight. I can’t be certain, but I believe he was hit by a car trying to cross the street. Shortly after leaving our hotel in Shanghai on the way to the airport, our bus was temporarily stopped in traffic after a motorcyclist was hit and was laying on the ground. If we saw two people hit in 8 days, imagine how often it must occur. They seem to be less germaphobic than most Americans. Their tap water is not potable unless you’ve lived there long enough to have developed resistance. They eat family style sharing multiple dishes, but do not give serving utensils, so everyone dips their own chopsticks into the common food. According to an article in the 11/14/12 China Daily newspaper, obesity is becoming more common in Shanghai. It said that roughly 40 percent of adults in Shanghai are obese or overweight. A survey released at the end of 2011 showed the average weight of male residents had increased by 2.9 kg (6.4 lbs), and weight circumference had increase 2.3 cm (0.9″) since 2000. Certainly they have much less obesity than we do in the United States, but it’s likely to get worse. They are less physically active, with motor bikes more common than bicycles, and their diet is getting more westernized. I saw many McDonalds, Haggen-Daz, and Starbucks in Beijing and Shanghai. We went to the China Academy of Chinese Medical Sciences at the Science and Technology Center (www.china-tcm.com). While our feet soaked in a tub of tea, someone came and talked about the center. It was started in 1955 under the direction of Mao Tse Tung. It mostly serves the government leaders. He said none of them have heart problems, cancer or high blood pressure. He said only Chou Enlai had liver cancer in 1976 when they were less developed. Next students massaged our feet while a doctor examined me, then my wife, while a woman translated. He felt the pulse with 3 fingers check on each side. He said I had problems with blood pressure and fatty liver and said I should lose 5-6 kg. I’ve not had problems with the first two, but wouldn’t argue with the last. He also asked if I had an eye problem. I actually have had some problems with eye inflammation, but perhaps he looked in my eyes and noticed the affect of a combination of air pollution and jet lag. He recommended 2 medicine, each ¥650 (about $100) for a month supply and said I needed to take it for only 1-2 months. He said I would be amazed at the difference. When I hesitated he asked if my patients take their medicine when I prescribe it. I ended up buying a one month supply for myself as I felt a little guilty they had spent all the time on us, and it was place that didn’t seem to get many foreigners. I figured if for nothing else, it would make a good blog post. In my n-of-1, non-blinded, non-placebo controlled study, I found no difference after taking the medications for one month. Well actually I did lose about 3 lbs, but I suspect that was from following my New Year’s resolution with more exercise and an even better diet. Considering that I felt the same, despite being a month older, maybe it did do something. I was going to try acupuncture, but our guide couldn’t find a place she felt comfortable recommending (sterile needles, etc.). Prior to the trip I obtained a hepatitis A vaccination. That’s the one viral hepatitis that can be transmitted by contaminated food, which although it doesn’t caused a chronic infection, can definitely put a damper on your vacation. China seems to be moving in the right direction in some areas related to health and the environment, which I hope they sustain. They don’t need to adopt all the practices of Western society, nor would I wish them to do so, but the Chinese people shouldn’t needlessly suffer from from such things as traffic fatalities, pollution, and smoking, and those things should minimized as much as possible. This entry was posted in Government, Travel and tagged health, medicine, travel. Bookmark the permalink.